Lightning events are one of the most interesting features provided by the lightning framework that will help you to couple the components that you build. So, let’s say that you have built a plethora of components in your application. So how do you bring them all together. Of course, you are not going to nest them all together in one single component or application. You need a helping hand to help the components interact with each other. There might be a component who would do the processing based on certain input data and then there might be another component who would simply display the processed results. In this scenario, the component who would display the results can be re-used across the application, every time you decide to display something. The keyword to achieve this is through “Lightning events”. Lightning events as the name says are events which are fired at one end and received at the other end. So, there are two aspects or rather two components involved here. One component fires an event and the other component handles the fired event. In the illustration below, it can be seen that there is an event defined and when a defined event is fired by the Component1, it is being handled by the Component2. 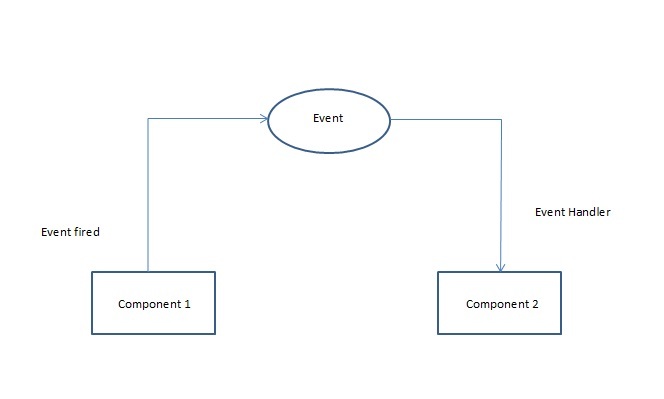 In this scenario, Component1 registers the event and Component2 handles the event. The beauty of using events lies in the fact that an event fired can be handled by any component as long as the component has the necessary event handlers. Thus an event fired by one component can be handled by n number of components present within the application. This helps two individual components which were not connected to each other shake hands with each other using events. In the above snippet, the event has been defined an an application event. Please note that there two types of events i.e. Application events and Component events. We will discuss on the event types later. As of now let’s focus on understanding events. The above event also has an attribute defined to it of “String” type. You can have attributes of all types as you can have in components. When an event is fired, the attribute values can be passed by one component which can then be received by another component who wishes to handle/process the event. In the next tutorial, we will look into navigating from one component to another component using events. Previous Previous post: Introduction To Salesforce Lightning Components : Build your first Lightning Component ! Nice Blog , Great Work. We are a team of 3 Salesforce Professionals who work as Freelance consultants and have been working on Salesforce platform since last 6 years and have been giving online training simultaneously. I am writing this comment to look for Opportunities of working together in harmony and creating a win – win situation for both of us. Our Salesforce school has 3 comprehensive courses , covering complete Salesforce (both Admin and Development) step by step including Salesforce1, Lightning Framework etc and a detailed course on Salesforce Integration. The reason I am writing this is to check, If you would be Interested in sharing a few lines about my courses on your website or to your List. I have done a similar activity with another Salesforce related blog and it was great. We also have an Affiliate program where you can earn 50% commission per sale. You will be provided with your own dashboard to monitor and track your sales and commissions. The Affiliate program is available at the bottom of every course page. Simply sign up as an Affiliate below any course page and start sharing the link. All payments are done automatically on monthly basis in the first week of every month. We can also work together and mutually come up with a discounted price specifically to help the readers of your Blog. I thought I’d give you first refusal to review my website before contacting other website/Blog Owners. If you could let me know if you’re keen to learn more, I’d appreciate it.